We were appointed by our developer client as landscape architects on this refurbished residential development located on the north bank of the River Thames, East London. The existing building is being converted for residential use and extended upwards. Our scope of works was to develop a landscape design, prepare landscape architect’s information to discharge Planning Conditions and the preparation of a full landscape architect ‘s tender pack of information to enable the tender of the external works. 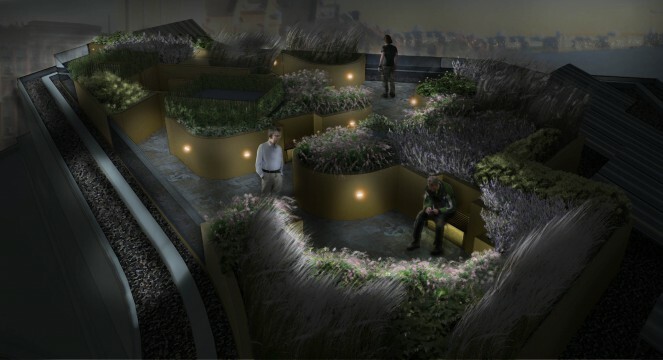 Our landscape design was focused on the roof garden garden area. This zone is to be accessed by the residents of this building, both during the day and the night. Our landscape architects needed to consider the exposed environment in this location as it is seven floors up and on the banks of the River Thames. Plant selection was critical to the success of this scheme. In addition we needed to be mindful of loading being imposed on the structural slab by our landscape design. We needed to create an environment in which residents would want to visit and enjoy the stunning views which are on offer. Access requirements to this roof space were also carefully considered and all areas have been designed so as to be fully accessible by all. At the centre of the roof space it was necessary to locate a large piece of mechanical plant. 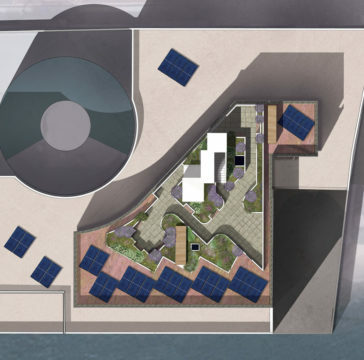 In addition, in a number of locations at the perimeter of the roof space, solar panels needed to be accommodated. Our landscape architects needed to carefully locate raised planters, planting and trellis panels with climbers so as to screen these items. 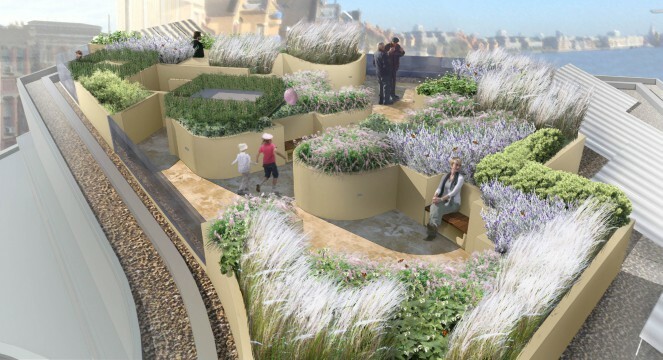 As this roof garden is located on the seventh floor, our landscape design needed to carefully consider health and safety. A combination of appropriately high planters and glass barriers ensure the residents of this development are kept safe.